The answer is an emphatic yes. 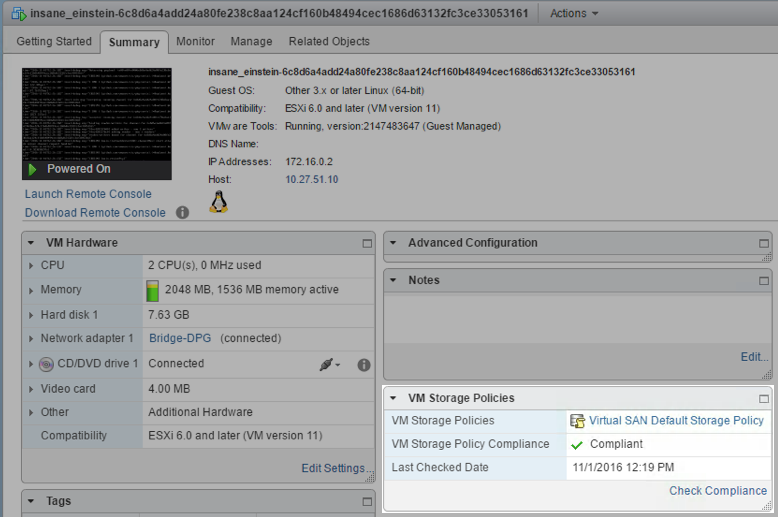 One can absolutely use storage policies with vSphere Integrated Containers (VIC). However, there is currently no way to specify a policy at the docker CLI when creating a container (at this time). Therefore one would have to deploy the VCH, then deploy the container, and then finally modify the storage policy as appropriate. My understanding is that consideration is being given to a way to do this at deployment time, but at the present, it involves a number of steps. Let’s discuss them in turn. INFO[2016-11-01T12:16:29Z] vDS configuration OK on "Bridge-DPG"
INFO[2016-11-01T12:16:31Z] Creating virtual app "virtual-container-host"
INFO[2016-11-01T12:16:31Z] Network role "external" is sharing NIC with "management"
INFO[2016-11-01T12:16:31Z] Network role "client" is sharing NIC with "management"
Let’s take a look at the VCH storage policy. We can clearly see that it is using the default storage policy for Virtual SAN. So there you have it. As a vSphere admin, not only do you have full visibility into the “containers as VMs” deployed via VIC, but you can also make VIC containers highly available from a storage persistent perspective. You can do this by deploying these containers on a storage system that is policy driven, such as vSAN. And you can then modify the policies according to your requirements. Great article, I have really enjoyed your article . You show how we can use storage policies with vSphere Integrated Containers . I was little bit confused about how I can use storage policies with VIC and now I completely understood with the help of your article. The best thing is that we can do this by deploying these containers on a storage system that is policy driven, such as vSAN. and we can then modify the policies according to our requirements. Thanks for sharing. The way you explained each and everything is really great. Thanks once again .